Day 293 – Maybe They Need Dancers In The Bannered Mare? 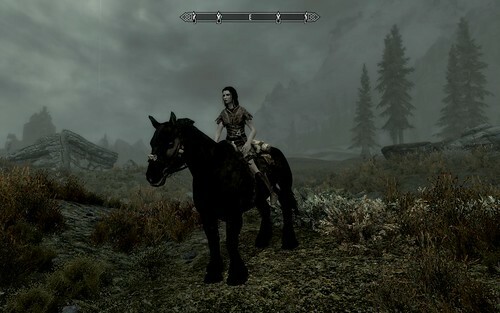 I still play Skyrim. Not every day, and not every week, but I still love the game a whole lot and get into phases where I want to play a lot. The modders for the game are insane, and they add new quests and new areas and it’s just amazing to me that they can do that! I mean, they make whole new areas and characters and it’s awesome! A couple of weeks ago, I was looking for a specific Skyrim series on YouTube [by the GroBroPros, if you’re interested.] 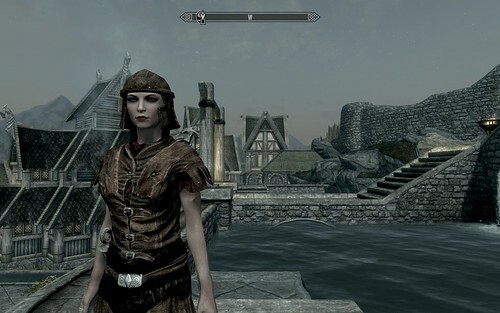 and found another one with someone playing as just a regular person – not the Dragonborn. I’ve seen things like this before and thought it was cool, but I wasn’t into playing like that. I wanted to be the Dragonborn, the thane of every area possible, and cheating like CRAZYPANTS because games to me are wayyyy more fun if I don’t die. LOL! 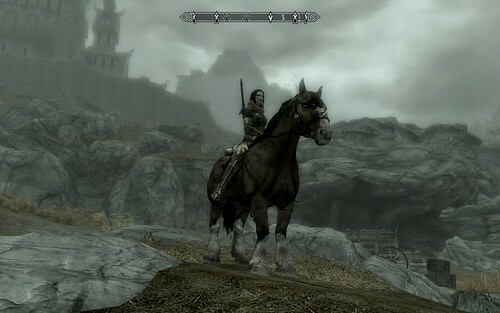 But watching the videos [Skyrim: Rags To Riches, if you want to see.] I started thinking. What if I played like that? What if I didn’t immediately get started in the war? 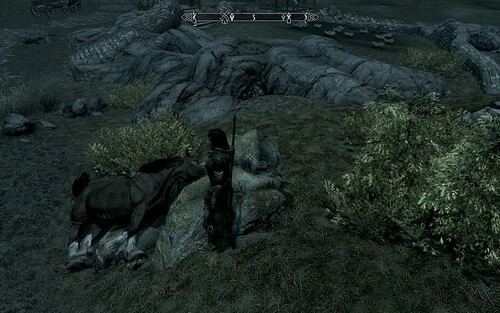 So my new girl went to Helgen. She saw the dragon attack. She was saved by Ralof and he taught her a little on how to shoot a bow. [This is VERY different for me because I’m usually more of a warrior and prefer to run into stuff and hack at them with a sword.] But as soon as they were out of the cave, she ran off on her own. She’s learning to sneak really well, and her archery skills are improving. 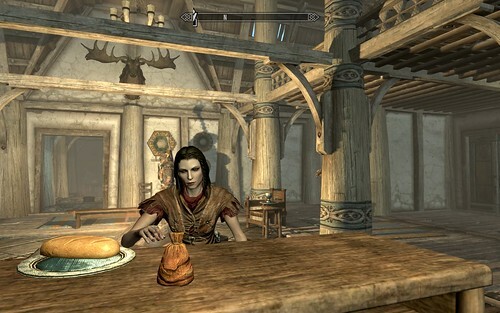 She’s a bit of a thief but so far uninterested in the Thieves Guild. Eventually she married [mostly for somewhere to stay and for the store money], and then managed to get well known enough to be able to buy property and build Lakeview Manor. After that, she ran back to Windhelm to adopt the cutest little girl. Some of my rules for playing this character is that I don’t use God Mode 95% of the time and I don’t fast travel. I can run and I can take carriages, but no fast travel. I didn’t realize how much I have missed in this game before!! Although I’ve been playing for a little over year now, I have stumbled into places I’ve never seen before and into quests I’ve never done before. It’s so fun! 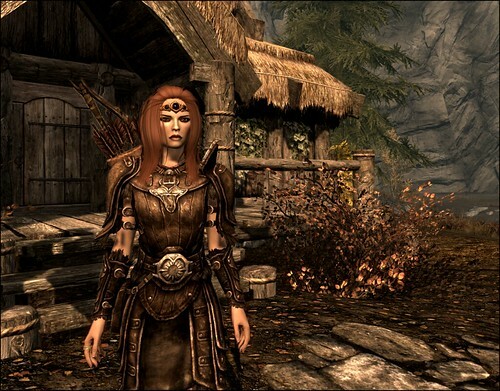 Now, eventually, my character WILL join the war, and she will find out she is the Dragonborn, but until then, she’ll just keep shooting that bow and stealing circlets. Of course, I had to pop into SL tonight to spend some time with my guy. But LOOK. He’s playing Skyrim!!! That’s okay, though. I can totally make my own fun. He says I distracted him. I don’t see how that could have happened.